Piling Canada is published quarterly in March, June, September and December. Each issue is mailed directly to more than 2,000 professionals involved in the Canadian deep foundation and industry; as well, the magazine reaches key contacts both in the U.S. and across the world. Using the standard publishing industry pass-along estimation of 3.5 readers per copy, Piling Canada has a total market reach in excess of 7,000 each issue. In addition to the print edition of the magazine, Piling Canada is now available in a digital format that can be viewed on your desktop/laptop computer, tablet or smartphone. 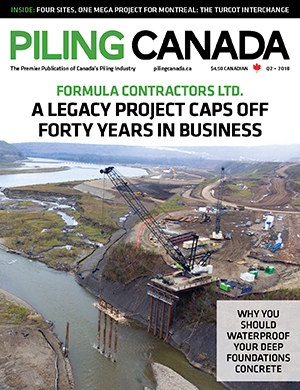 This online companion to the tradition print format has all the content you have come to expect from the premier publication of Canada’s piling industry, plus the visual enhancements that make a digital magazine a rich and immersive reading experience.